When it comes to staple foods in the Caribbean, plantains are as popular as rice. Plantains are grown all over the islands and are used in all kinds of recipes from desserts to savory dishes. Plantains are a staple in the Latin Caribbean diet. They are prepared many different ways, but tostones is the quickest and easiest. It’s a perfect recipe for beginners. In Puerto Rico, “jibaro” is a reference to the islands rural, agrarian population, but in Chicago, a plantain sandwich - jibarito is a unique and original sandwich created by Puerto Rican immigrants. Its distinguishing feature is the replacement of bread with smashed fried plantains. My jibarito version has a roast beef filling with Swiss cheese, lettuce, tomato and seasoned mayonnaise. You can make these large or small for party sandwiches. Green plantain turkey stuffing, also called Mofongo Stuffing, is an excellent alternative to the traditional breaded and meat stuffing associated with a ​Thanksgiving turkey. This mouthwatering stuffing is made from plantains, bacon, garlic, and ajíces dulces (sweet chili peppers). 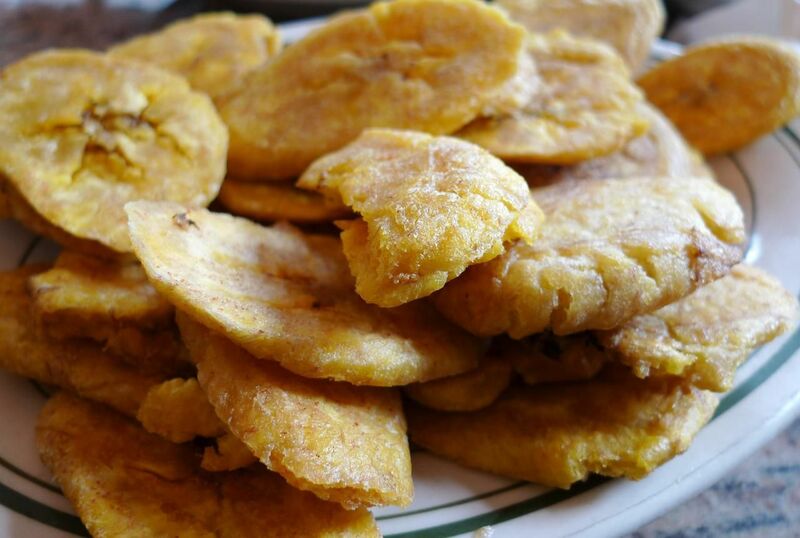 The key to an excellent plate of sweet fried ripe plantains is to ensure that the plantains are at the right degree of ripeness. The skin should be almost black or in some cases, have a dull yellow color with patches of black. The riper the plantain, the sweeter. Here is an easy plantain recipe for ripe (yellow) plantains. These cheese stuffed yellow plantain balls have a savory cheddar cheese filling that bursts in your mouth. They make great appetizers or snacks. This Cuban fufu recipe is similar to Mofongo Stuffing (a green plantain stuffing), but the recipe calls for ripe plantains. If you don’t like green plantains, you can make this sweet plantain stuffing mashed with bacon and onion. This recipe makes a sweet yet savory turkey dressing or side dish. Here is a very simple, yet delicious way to enjoy sweet yellow plantains. You can also roast the plantains on a grill. You can also use garlic salt or seasoned salt in place of regular salt for these baked yellow plantains. Piononos are the perfect finger food. These delicious plantain bites are battered, fried, and stuffed with cheese.